History: :Tom Strange is a scientific genius who developed a serum called Alosun, which is described as a distillate of sun atoms. Ingestion of this serum gives Strange incredible powers. 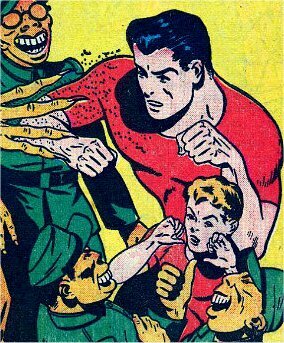 He used his new abilities to fight against the axis of power for the duration of WWII. At this time Strange took in a young orphan, Mike Ellis, as his partner. Often times his girlfriend Virginia would accompany them on various missions. Comments: Image on righttaken from Steve Rogers' Golden Years Comic Book Library. Thanks to Suvok for additional information. Doc Strange has been revived a couple of times since the Golden Age. Americomics briefly brought him back, before killing him off in Femforce #43 (thanks to Mike Murphy for informing me of this). And Alan Moore has revived him for ABC's Tom Strong comic, renaming him slightly as Tom Strange.